I've been meaning to make these for so long! A long time ago I was drooling on a Mini Boden catalog and they were displaying their tights one leg at a time and I thought: "wouldn't it be fun if each leg were different??". That kind of whimsy appeals to me because it just reminds me of how kids are. Paige doesn't care if her clothes match, as long as they are the ones that make her happy. She doesn't sit in front of her closet thinking: "What would Sarah and Lexi think if I wore stripes with polka dots??". Kids=humans before peer pressure. I adore them, guys. Kids make me so happy. Anyway. Leggings. I finally sewed some last night after the bean went to bed and they turned out just as cute as I'd hoped! And it was love at first sight when Paige saw them in the morning. "Oh, Mom! Those are crazy legs!!" She wanted to wear them all day, so that's a good sign. My only regret? Using the wrong size of leggings as a pattern. Arg. It turns out, when you leave leggings in the "to-do" pile for months, they get too small. Lesson learned. So they turned out a little small, but oh well. She can still wear them for a while. Are you ready to make some? Let's do this. 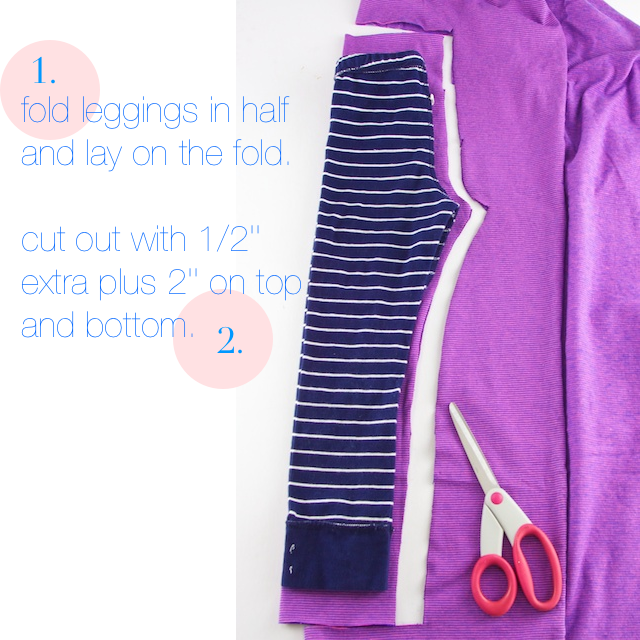 Fold a pair of leggings (that fit!) 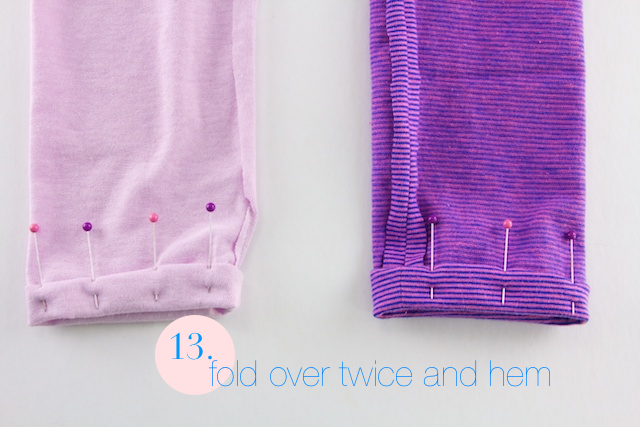 in half and lay them on the fold of a stretchy knit fabric. Cut around them as pictured and then trace that piece onto another fabric for your second leg. 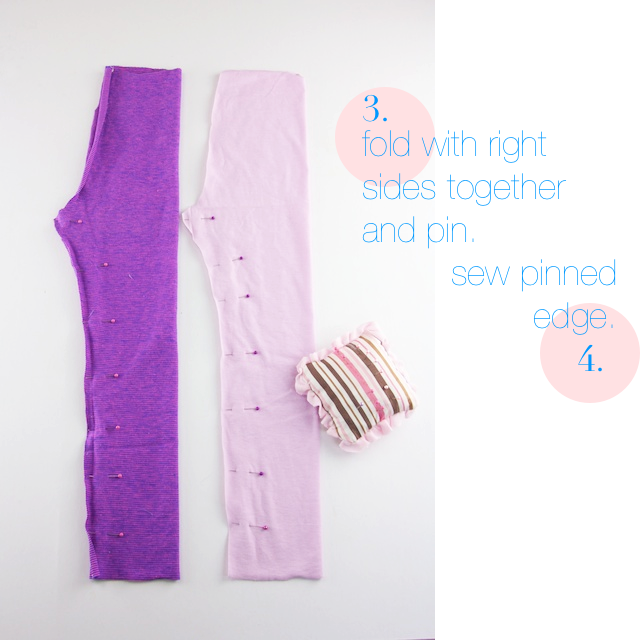 Fold each leg piece over itself with the right sides facing each other. Pin just up to the pointy part and sew. Pin the tops together with the crotch seams matching up. Sew, leaving the top open. 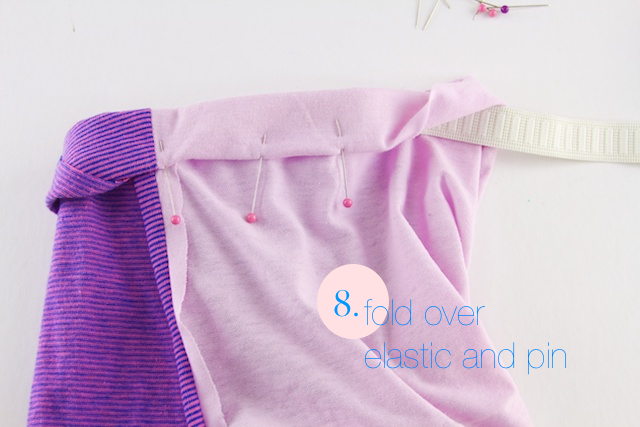 Then fold over your elastic and pin casing in place. 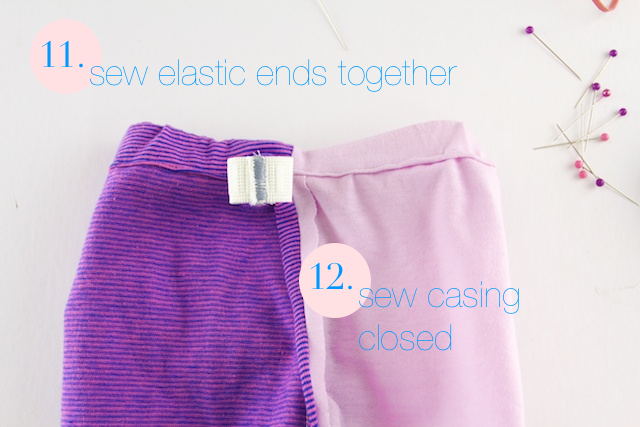 Sew close to the edge, stretching the fabric as you go, leaving a 1'' hole to insert your elastic. 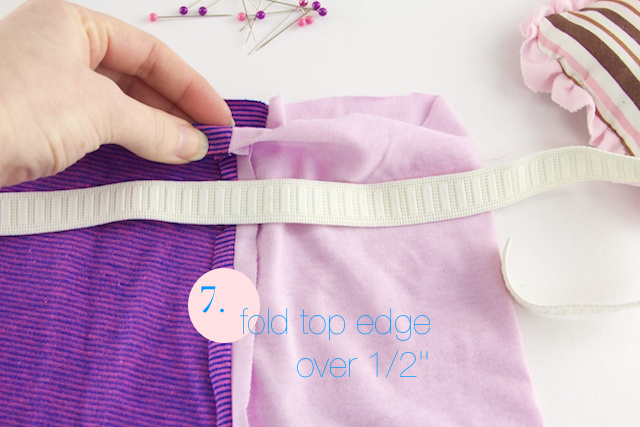 Overlap the ends of elastic 1/2'' and zigzag together. Tuck into the casing and sew the hole closed. Then you just need to hem up your little leggies. 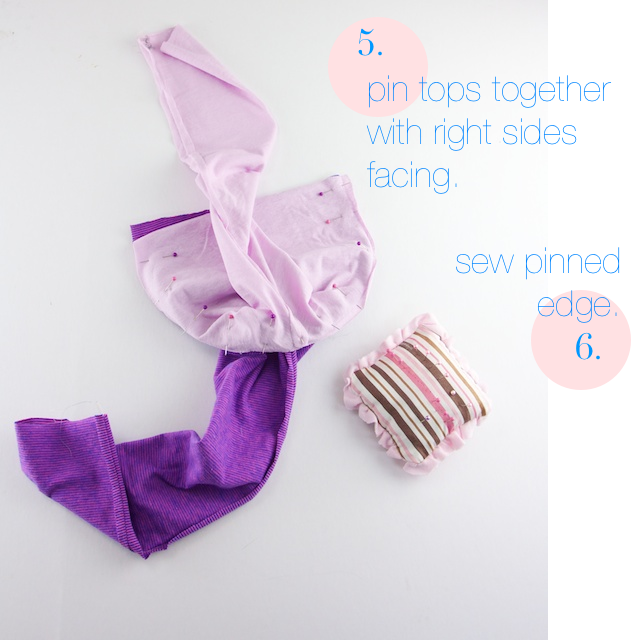 Again, be sure to stretch the fabric as you sew if you use a straight stitch. Or you can use a zigzag. If you have a double needle, now would be a great time to use it, too! I need to get me one of those babies. Wouldn't these be cute in solid colors?? I didn't have any solid knits, but they're easy enough to find if you have a fabric store in your town. And if your pumpkin is small enough, you could even use t-shirts for your fabric! I bet you could find all sorts of unique prints and patterns. Yes, she's still kickin'. I'm glad, I was about to be really sad! I did a report on her in elementary school :) These are super cute - great tutorial! I might make some for myself as jammies. Thanks for sharing your work with us! You can reassure your little one that Shirley Temple is very much alive. :) She is 84 years old. Well don't I feel like the silliest person alive...too cool though, I need to write for her autograph for Paige!! Awesome! Business in the front, party in the back. Too cute! These are fun and so adorable..my little gal, Darby would love these. She dresses for her own happiness and I love her unique style. Thanks for a great tutorial! ARGH! Paige couldn't be any cuter (or more stylish). American Apparel sells two color tights for a ridiculous amount of money, and obvi we don't need to spend that kind of cash if we sew! Adorable and perfect. Kid style should always be a bit quirky and fun, I think. Right?? She has way better fashion sense than I do. I seriously consult her for color advice on a lot of projects. 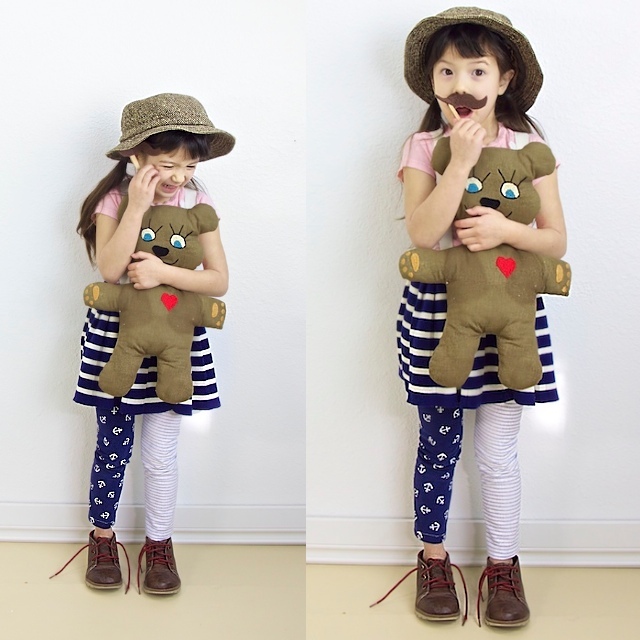 And I totally agree, I love quirky kid style! What a cute idea! My two girls would love this! Love Paige's hair! Where did you buy your knit fabric? Love, love, love! I recycle old tee's for the fabric too because knit is usually pretty pricey in the store. This past week I found new tee's on clearance at CVS for $1.25 each! AND, some of them were size 4x, which means more material!! Recycle, revamp, recreate! Love these. And I'm pretty sure I'm going to have to make an adult version. Granted, I won't be able to rock them as well as Paige, but I can try. Thanks for sharing! What a cute idea!! Loving this, Disney! These are so cute, but I'm lacking a little one to dress in them. Am I too old to make a pair for myself? Your daughter is absolutely gorgeous. What a creative and fun project. :) I kind of want some for myself.. hehe. These are awesome! I love seeing what you come up with! These are so cute. Has Paige gotten taller in the last few months? She looks taller. She did grow quite a bit over the last couple of months! It might be the camera angle, too. Super Cute! 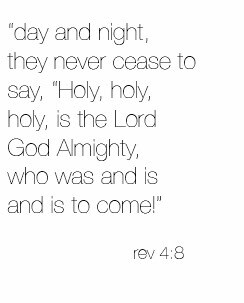 Love it and sharing on pinterest. You are an inspiration! i love these! and she looks so comfy and mismatched!!! and wow- she looks so big in the shot where she is sitting down and tying her shoes!!! These leggings were totally on my mind, and now that I see them here, so adorable, so gorgeous, I can't wait to really finally try it. those navy ones?! Dying over how fantastic they are Disney. And could Paige be any cuter? Love love love them! 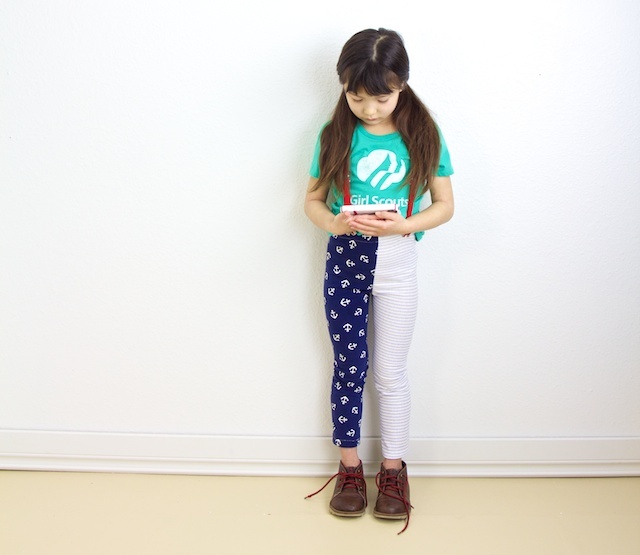 Really cute leggings and excellent directions! I have to ask, where did you get that adorable teddy bear cardigan? Ahhh, so amazingly cute and creative!! Oh, I soooo need to learn how to sew! My girls would love these! I learned a different technique for sewing together pants that I find so much easier than the traditional way that I was first taught that you have also used here. You sew the front and back center seams first, then the inside leg seams in one continuous seam, from one ankle to the other. Is that as clear as mud? It basically eliminates the fussy matching that you deal with when sewing all the leg seams first. Oh my goodness! You just blew my mind right now! That is a way better way of doing it, thank you so much for passing that along. I will definitely try that next time. 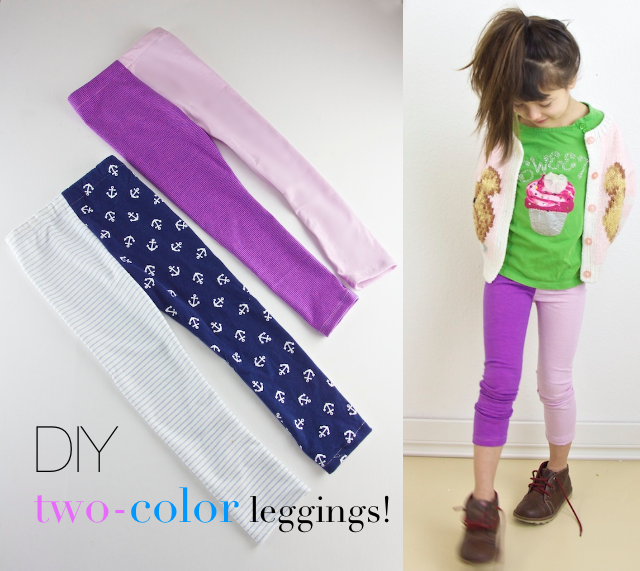 I love love love the anchor and striped leggings! Oh that just breaks my heart. Your poor little pumpkin. And I feel so sorry for those other little girls, goodness knows what is making them act that way...? I love these :). And I love her outfits! The girl scouts shirt? I want! Perhaps you would like to visit my blog, check my version out, and let me know, if you like it? I would really appreciate it. I just made my 10mth old a pair of leggings. I so want to make some polka and strip ones, also some cute lace ones to go under some cute shorts she has. Fashion forward baby...lol. I used a stretch stitch to finish the waist and legs. I had the hardest things with that twin needle.